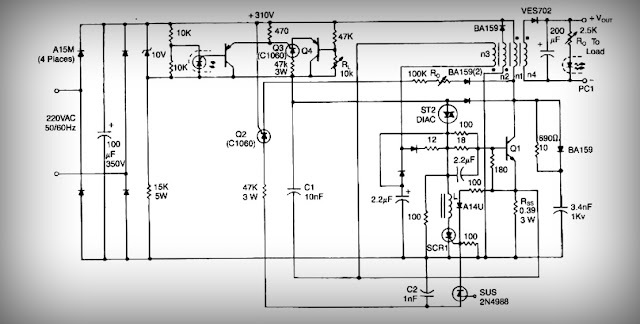 This is low voltage high-current ouput switching dc power supplly wiht input 220 Volts AC , In this circuit , an St2 diac relaxation oscilator, Q3 , C1 , and the diac , initiates conduction of the output switching transistor Q1, the on time of which is maintained constant by a separate timing / commutation network consisting of Q2 , C2 ,SUS , and SCR 1. The output voltage , consequently , is independent on the duty cycle . 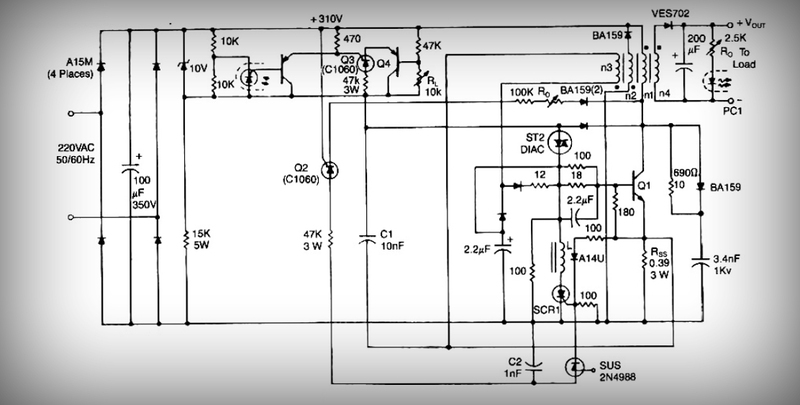 To compensate for unwanted variations of output voltage because of input voltage or load resistance fluctuations , an H11C wired as a liniear - model unilateral pnp transistor in a stable different amplifier configuration is connected into the galvanically isolated negative- feedback loop.